Use a decanter and glass set that is as bold as your whiskey! Want a glass set as bold as your best whiskey? 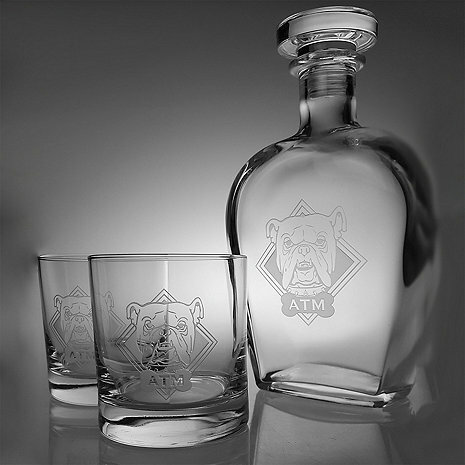 The bull dog design is etched deeply into the glass surface and carved with 3 initials. A great groomsman gift, wedding gift, anniversary, Father's Day gift or birthday gift for any whiskey, bourbon, scotch, and/or bull dog lover. Includes one decanter and two double old fashioned glasses. Decanter Capacity: 23 fl oz. Glass Capacity: 11 fl oz. The product is very nice. Well-designed and exquisite looking. I love it! I recommend this product to anyone looking for a nice gift for themselves or others close to them and well-deserving of a fine keepsake. I really enjoy my BullDog decanter! I also purchased one for a n employee.